At Cornerstone, we talk frequently about dosing, not just because it’s important to members, but also because it’s important to us. The end goal is for every patient to experience the maximum benefit of medical cannabis. Although it seems tempting to think that more medicine always means more healing, that’s just not the reality of how cannabinoids are processed in the body. In truth the body’s response is much more complex. Exhibit A: This is a graph that illustrates anti-inflammatory properties of cannabidiol (CBD) at various doses. You’ll notice that the shape is a bell curve, meaning that in many cases, more CBD could actually equate to less anti-inflammatory help. This is not a graph mistake; it’s a common observation of the effects of CBD. In other words, dose matters. As seen, the greatest effect of CBD will occur at the middle of the curve. Because dosage depends on body fat, tolerance, and a host of other individual factors it is very difficult to advise users on “the most effective dose” for them. Cornerstone can offer you suggestions, but ultimately, individual patients are going to have to discover what amounts and what dosing schedules work for them. What is clear to us though, is that patients may get more out of their medicines by showing restraint. All that aside, wouldn’t it be great if CBD could be given in a preparation that was not dose-dependent? 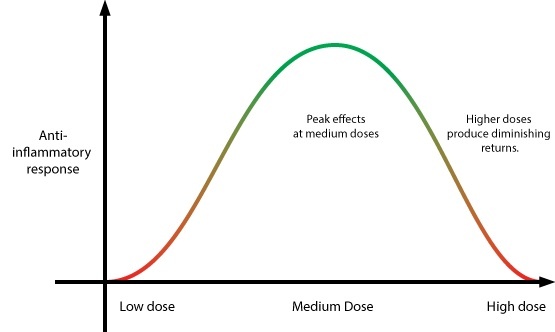 Shouldn’t there be a way to beat the dose curve? This is exactly the question Israeli researchers asked last year, on a hunch that CBD combined with other cannabinoids might be more effective than just pure CBD. 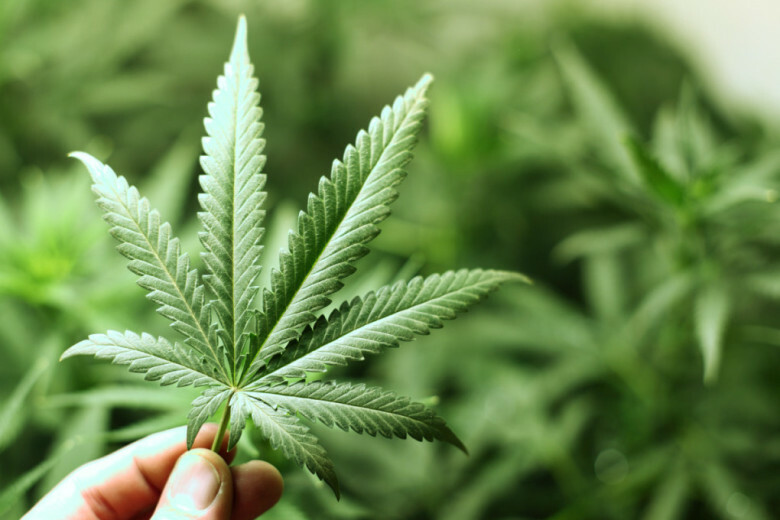 Researchers noted success with a particular strain of Israeli government-grown cannabis called “Clone 202”. A strain high in CBD and low in THC, much like our ACDC strain we use to make our healing oil. In response, researchers decided to formally test both pure CBD extract and whole flower Clone 202 extract on mice to note the difference in both anti-inflammatory and anti-pain properties. The set-up involved first artificially triggering swelling in the mice by injecting Zymosan A, a chemical that causes swelling, into the back right foot pad of each mouse involved. While this is an artificial cause of swelling, it mimics swelling caused by a variety of natural causes pretty well. 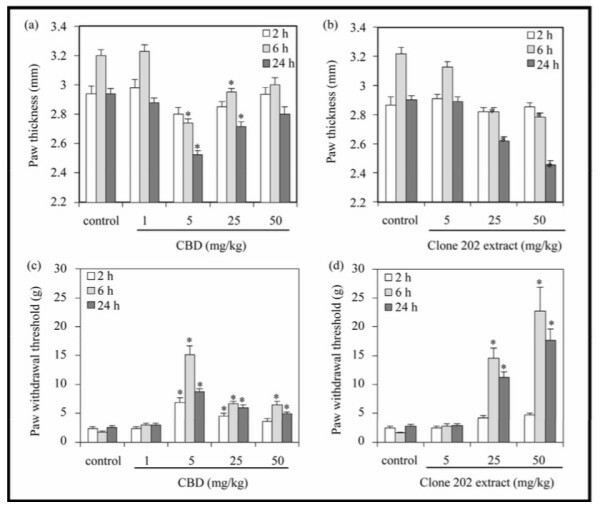 A portion of the mice were then administered pure CBD extract or Clone 202 extract, while others were administered a solution without any cannabinoid content at all. Afterwards, two tests were run on the mice at two hours, six hours, and 24 hours after the swelling injection. The first, used to measure inflammation, was a paw-swelling test. This test uses small calipers to measure the increase in thickness of the swollen paw, using the opposite side paw as an un-swollen basis of comparison. The less swelling that occurs, or the less the paw thickness measures, the greater the anti-inflammatory properties being observed. The second test, the paw withdrawal threshold test, was used as a gauge of pain from physical stimulus. This test pokes at a mouse’s paw with a small force until the paw moves away to avoid discomfort. The force used at the time of paw withdrawal is recorded. Thus, the greater the paw withdrawal threshold, the greater the anti-pain properties being observed. Above we have the graph of extract injection, although the graph of oral administration follows the same pattern. As seen, swelling is highest without any extract. With pure CBD, the swelling dips to its lowest at 5 mg before spiking up again (graph A), while with Clone 202 extract (graph B), the swelling continues to drop up to the maximum amount of extract. This effect is mirrored in graphs C and D, where pure CBD shows greatest pain threshold at 5 mg before plummeting again, whereas Clone 202 extract shows increasing pain threshold up to the maximum amount of extract. In both cases, the maximum effect of the 202 extract is greater than the maximum effect of the pure CBD extract, which means that not only has the dose-curve been eliminated, but the total healing power has also increased. “Synergy” is one of those phrases that boomed in 90’s corporate culture and then almost as abruptly passed out of usage. The concept, however, stayed relevant because it has real merit; synergy is the idea that two things working together could be more effective than both working separately. Likewise, CBD is known to be the main source of the anti-inflammatory properties of cannabis. Yet as seen in this study, CBD alone is not necessarily the most effective at treating pain or inflammation. This means that somehow other cannabinoids or chemicals in the 202 extract are changing the way that CBD is being processed by the body. On the one hand, this is frustrating, because we’re still running tests on organic combinations that cannot easily be standardized. It’s impossible to know with these kinds of tests what effects are coming from where. On the other hand, this is also a reason for hope, because it means that the interactions between cannabinoids are worth studying and may offer insight into how to create better medicines for the future. Ruth Gallily, Zhannah Yekhtin, Lumir Ondrej Hanus. (2014) Overcoming the Bell-Shaped Dose-Response of Cannabidiol by Using Cannabis Extract Enriched in Cannabidiol. (2015) Pharmacology & Pharmacy 6:75-85.